I’ve had sheet caking on the brain ever since Tina Fey inspired the devil’s food sheet cake a couple of months ago. Don’t get me wrong, I still adore making layer cakes, but sheet cakes are just so innocuous. 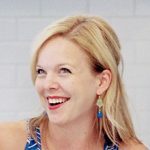 A slice of layer cake for snacking? No way! A harmless little square of amazing sheet cake? Don’t mind if I do. This recipe has ALL OF THE GOOD THINGS. 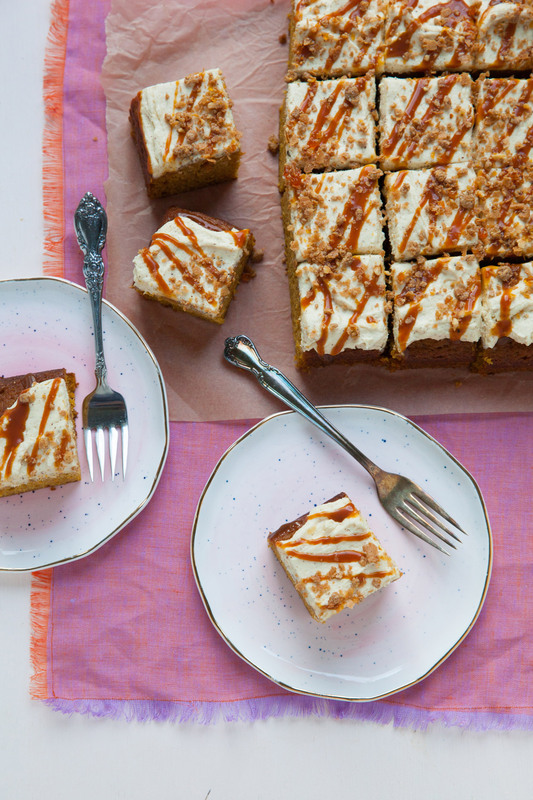 Super tender and moist pumpkin spice cake, fluffy brown butter frosting that brings to mind the term “foodgasm”, and a drizzle of vanilla bean caramel sauce because when has that ever made anything worse? Believe me, if you stop right there with those three things you will still have a phenomenal cake. However, I decided to take it one step further by adding hazelnut crunch. This stuff may seem unnecessarily involved but here’s the thing – it’s insanely delicious and it stores beautifully. Make a batch (you’ll have way more than you need) and sprinkle it on ice cream, add it into layer cakes, pour directly into your mouth – whatever floats your boat. I think it adds a really nice textural contrast and a nice warm nutty note to the overall flavor. Whichever way you decide, with or without the crunch, you’ll love this cake. This would also adapt beautifully into cupcakes. The cake recipe should yield about two dozen cupcakes. I would at probably up the frosting by 50% to make sure there is plenty for a nice dome on top, and garnish as desired with caramel sauce and/or hazelnut crunch. To make the cake, preheat the oven to 350°F. Line a 9 x 13-inch baking pan with parchment paper. In a medium bowl, sift together the flour, baking soda, baking powder, cinnamon, nutmeg, cloves and salt. Set aside. In the bowl of an electric mixer, blend together the pumpkin, granulated sugar, brown sugar and oil. Add the eggs one at a time, beating well after each addition. With the mixture on low speed, add the flour mixture in two additions, mixing just until incorporated. Bake until the cake is golden and set in the center, about 25-28 minutes. Transfer the pan to a wire rack and let cool for 10-20 minutes, then use the parchment to lift the cake out of the pan and let cook completely. To make the frosting, put the butter in a medium saucepan over medium heat and cook, stirring frequently, until golden brown and aromatic, about 3-5 minutes after the butter is fully melted. Pour the brown butter into a bowl and let cool to room temperature. In the bowl of an electric mixer, combine the cooled brown butter and the cream cheese. Beat on medium-high speed until smooth and fluffy, 2-3 minutes. Add in the confectioners’ sugar, vanilla and salt and beat 1-2 minutes more. Add in the cream and whip on medium-high speed for about 4 minutes, scraping down the sides of the bowl as needed, until the frosting is very light and fluffy. 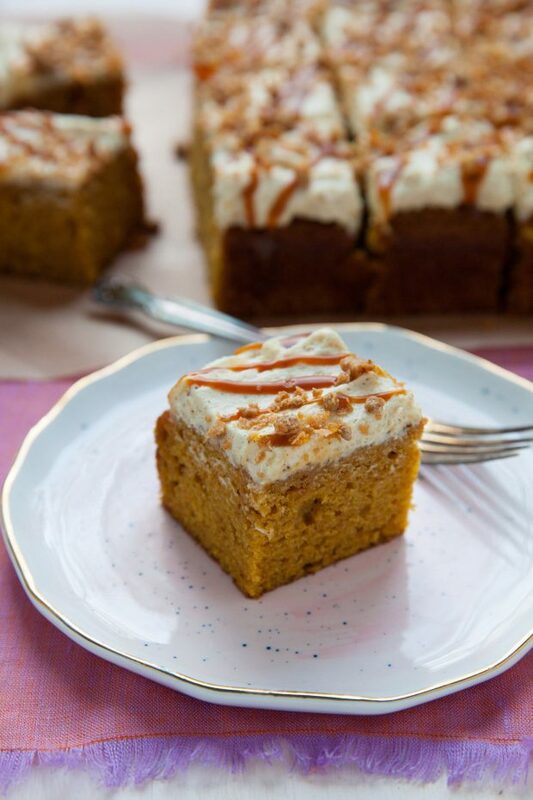 Use an offset spatula to spread the frosting over the top of the cooled pumpkin cake. To make the hazelnut crunch, you will first make hazelnut brittle. Line a flat baking sheet with a silicone baking mat. In a small saucepan, heat the sugar over medium-high heat. As soon as it starts to melt, use a spatula to constantly move it around the pan. The goal is for all of the sugar to melt and caramelize evenly. Continue cooking until the caramel is a deep amber color but is not burnt (about 3-5 minutes.) Once the caramel has reached the desired color, remove from the heat and stir in the hazelnuts. As soon as all of the nuts are coated, pour onto the prepared baking sheet and smooth into a thin even layer. Work quickly because the caramel will set rapidly (less than 1 minute). Allow the brittle to cool completely. Take half of the hazelnut brittle (about 125 grams) and break into pieces. Add to the bowl of a food processor along with the grapeseed oil. Grind until the brittle has completely broken down and almost liquified. This is hazelnut praline paste. Drizzle the frosted cake with the caramel sauce. Sprinkle with some of the hazelnut crunch just before serving, if desired. If you plan to use the hazelnut crunch, make it first. You’ll be so glad you did when that frosted cake is just sitting there, begging to be eaten. Add the hazelnut crunch just before serving, as it will soften over time after being in contact with the moisture of the frosting.